- Warp 14.1 (the maximum speed the Enterprise travels during this episode) is nowhere near fast enough for the Enterprise to travel 1000 light years in a single day. Even at warp 15 (~3375 times the speed of light), it still would have taken the Enterprise months to travel 1000 light years. - The lieutenant at the helm measures the time it will take to arrive at the planet in "solar hours." What the hell is a solar hour? 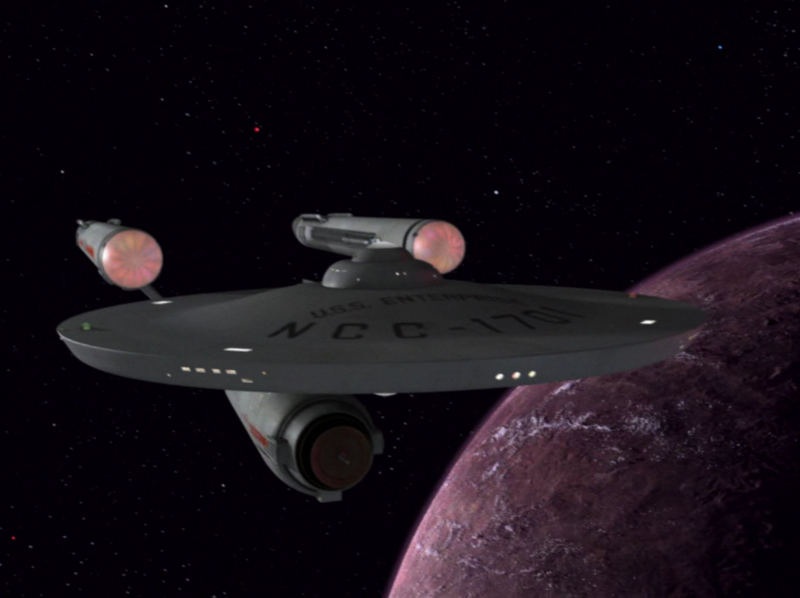 - The Enterprise travels at its fastest (natural) speed ever: warp 14.1. - Uhura: "What happened?" Spock: "The occipital area of my head seems to have impacted with the arm of the chair." 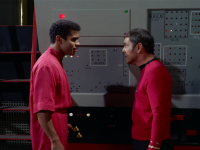 Uhura: "No, Mr. Spock, I meant what happened to us?" 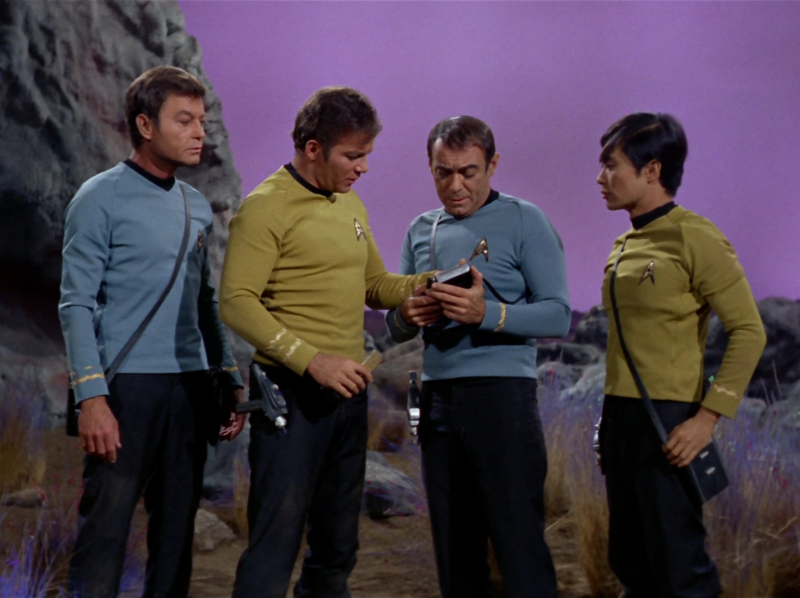 - Kirk: "Mr. Sulu, if I wanted a Russian history lesson, I'd have brought along Mr. Chekov." - Spock and Scotty's silly scenes. 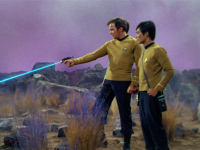 - Sulu: "Terrible way to die." Kirk: "There are no good ways." 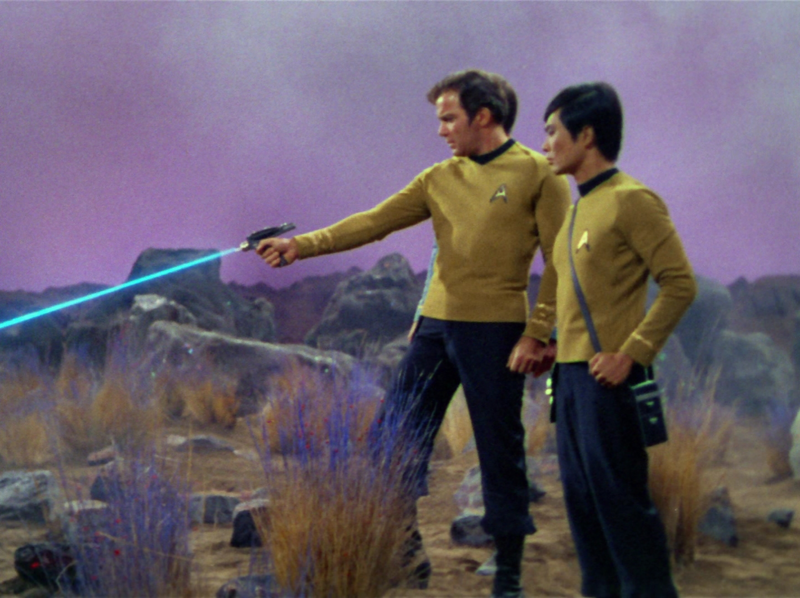 - Losira withstanding Sulu's phaser blasts as if they weren't there. - Spock: "Beauty is transitory, doctor." A planet even Spock can't explain! I giggled at such an amusingly goofy opening line and I enjoyed the scientific paradoxes presented by the planet. 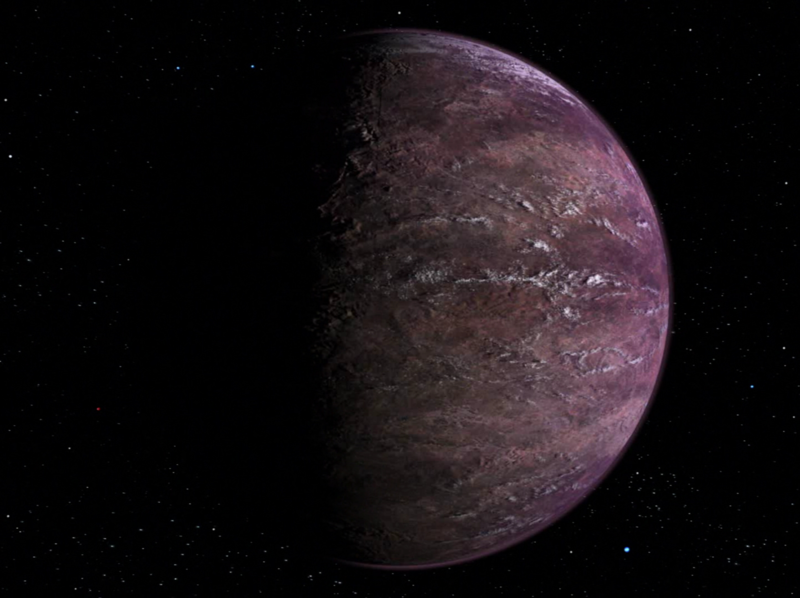 It's only a few thousand years old and the size of Earth's moon, and yet it has vegetation, significant atmosphere, and Earth-like gravity. Much like the mystery of the scientifically implausible planet, Scotty's near-suicide mission and the landing party's terrific command of survival skills in the sudden absence of the Enterprise were nicely done. I also was struck by how cranky Spock was all episode. I've never seen him so difficult to get along with! The explanation that the planet was artificially created reasonably explains away all the paradoxes, but the story about the people who created it totally fails to deliver. As Losira slowly starts killing people, her inability to communicate anything resembling a motive gets more and more frustrating. 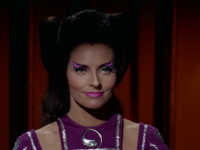 In what is perhaps the longest Star Trek has ever dragged out establishing a character motive, Losira's motives only become apparent in the very last scene of the episode. At the end we learn that her people, who are yet another alien race that looks exactly like humans, died out due to a disease they accidentally unleashed on themselves while creating that planet. The image of Losira attacking people was due to a computerized defense mechanism that was set to auto attack anyone in the vicinity not of Losira's people. Somehow Losira's personality was fused into the computer before she died, which explains her ambivalence to all the killing she did. The end of the story gave us a motive, but not a reason to care, resulting in quite a flop. 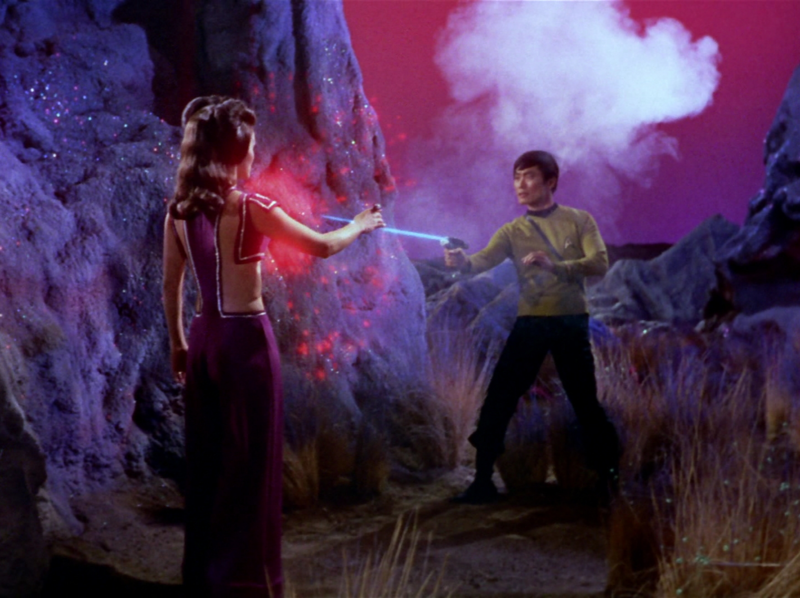 Another thing I noticed about this is how at the very end Spock shows up with one Redshirt(tm) and one quick phaser shot destroys the computer that was creating the artificial women. (Although it continues to spin in crazy patterns, just more slowly). An awfully quick solution so the danger certainly seems to have been manufactured and then conveniently disposed of once it's time to end the episode, I quite agree. So here's another supercomputer destroyed. But shouldn't Kirk have argued it to death? Another remarkable scene - or rather sequence - from this episode: Scotty's time in the crawlway. The tension it generates is palpable and the final moments, when he's panicking over the magnetic probe ("it's stuck!") are pure gold. It feels very real; on the whole, a great episode for Scotty. I was also very excited to see the female navigator! That actor was also one of the Native American women from "The Paradise Syndrome." 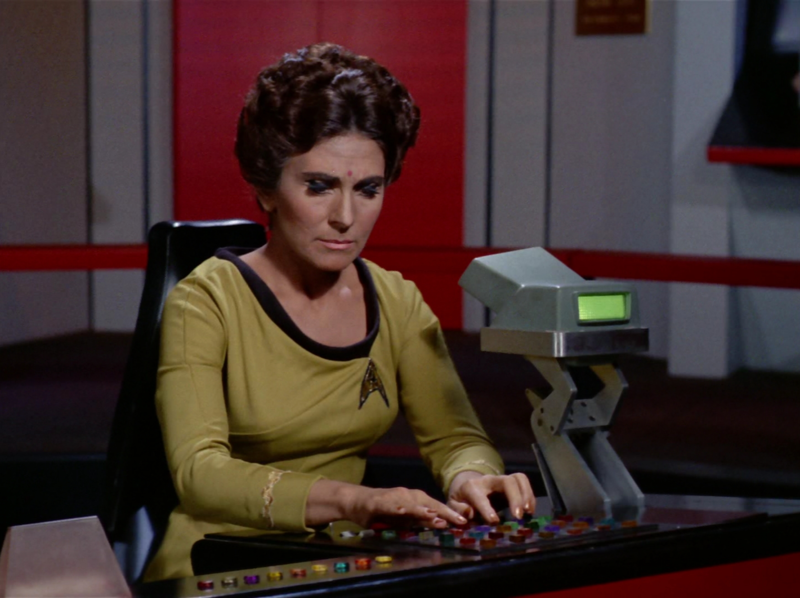 While she was portrayed as a competent helmsman, you could also see that she was new to bridge duty and probably to working with Spock, because she makes a few mistakes that a person used to this dirty wouldn't have made. Though it's true tat ST has a mixed record in portraying women, I found these details to be realistic and not necessarily based on Radha's gender. I liked how big a role D'Amato played before his (inevitable) death--he really seemed to fit into the landing party, like he'd been with them before. And he got to offer some real expertise in his field, as well. Unlike all the doomed redshirts, I was sorry to see D'Amato go. He'd have been a good addition to the supporting cast. The actor who played him, Arthur Batanides, became a very accomplished television actor. Spock is awfully "Spocky" in this episode, isn't he? None of the irritated humor of "The Mark of Gideon," and none of the stress we usually see when he's worried about Kirk. However, it's my observation that the more deeply Spock feels emotions, the more Vulcan he becomes in response. Also, in this episode, he has what's essentially a science problem to solve, and that's what he's best at. 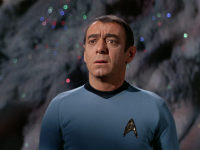 Lots of good Scotty scenes in this episode as well. 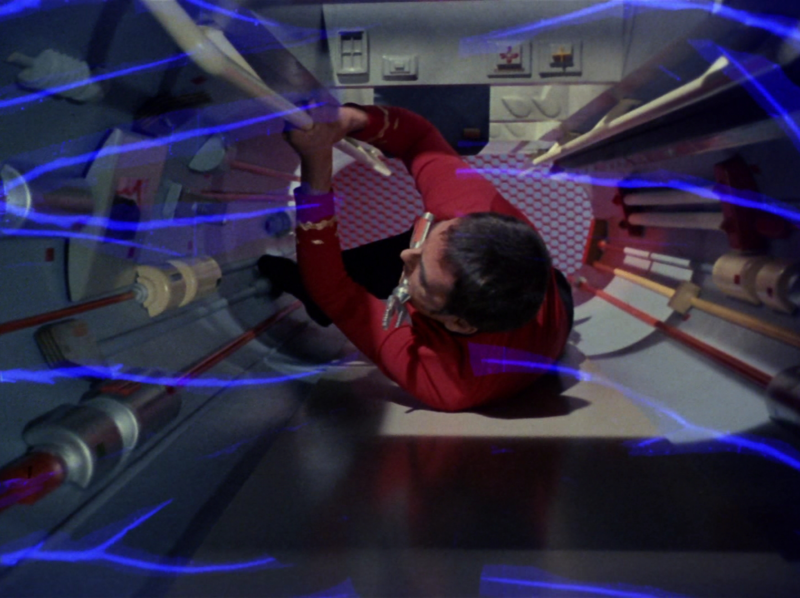 I loved when Scotty had just saved the ship against all odds (again) and Spock starts lecturing him on humans' need for gratitude, and Scotty just collapses in the crawlway in relief. 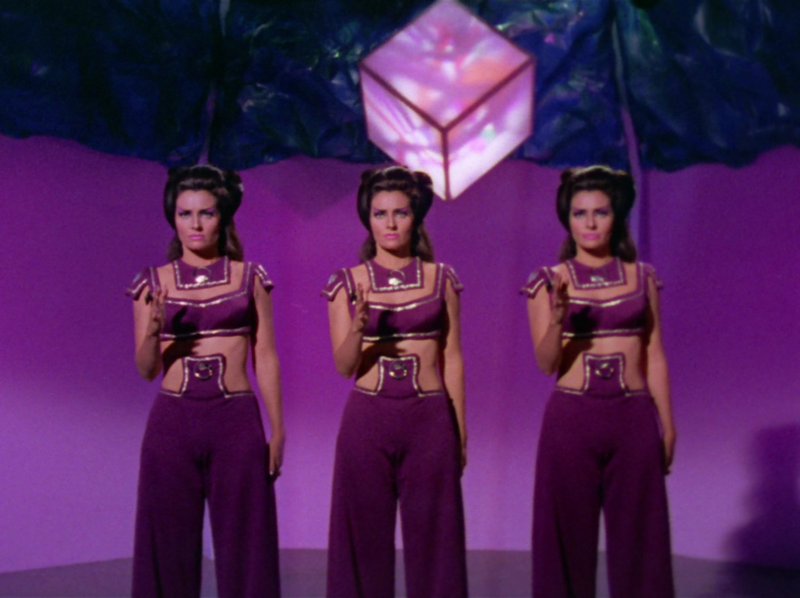 Otherwise this episode's plot is weak, and the disco ball/cube computer corny. 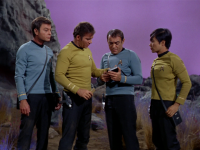 And I wanted Spock to tell Kirk, "Dude, we got the Enterprise up to warp 14.1! It was AWESOME!" So a solar day is 24 hours long. On a starship carrying humans it makes sense to emulate 24-hour days. In "The Conscience of the King" Kirk even says that's what they do. Hence, solar days on Star Trek. I like the scene where Scotty saves the ship. But why doesn't Spock say thank you? He says that in other episodes. Anyway, it works here, so that's good. Yeah, lame episode. What's the point of custom killer women who all look exactly the same? And the light-show computer? Bizarre. What's with that additional piece of Miss America's costume covering up her belly button? Looks silly. It's purpose is just so blatantly obvious. 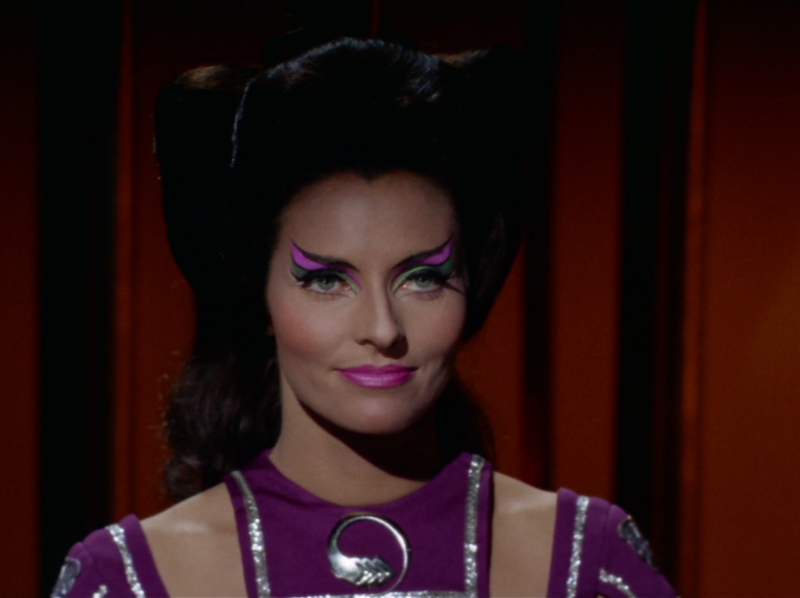 Didn't we see Nichelle Nichols' navel in "Mirror, Mirror"? And Nancy Kovack's (Nona) in "A Private Little War"?